It's Passover this week, which to many most people means two choices: meals served on matzoh, or meals with matzoh mixed in. Nuh-uh, not in my house. Here is an example of the kind of meals my family enjoy. 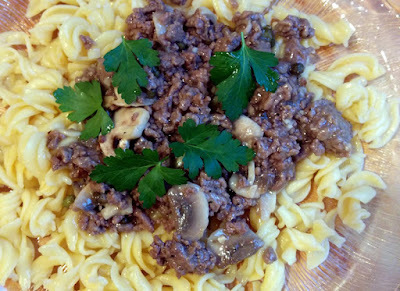 Ground beef, sauteed with mushrooms and other yummy add-ins, served over Passover-friendly spiral noodles made of potato and tapioca starches. Perfect even if you don't celebrate Passover, but happen to have gluten issues. A bit of wine reduction (which sounds fancy-schmancy, but really takes more time to say than to do) gives the flavor a grown-up kick. The interesting thing about this recipe is that it came about totally by accident.